Keeping control of your personal finances doesn’t have to be a chore. Having a budget can go a long way into preventing financial issues, especially personal bankruptcy. Creating a budget can be extremely simple. You just have to sit down and lay out exactly how much you make and how much you need to spend on bills. This will show you exactly how much you have left over to put toward paying off your debt. While creating the budget can be simple, sticking to it is the tough part. It is possible however, so be sure to keep that in mind. It only takes a few changes in your lifestyle before you can make it work for you. Having trouble spending money you don’t have? There are many people who struggle with this. You just have to think about the pros and cons of making your purchases. How badly do you really need the item you feel you just can’t live without? Chances are if you give it a day or two you’ll realize that it isn’t as necessary as you thought it was. There are many systems out there you can use to make your shopping trips more productive while spending less. Try shopping with just cash. While this may sound like a pain it will help you spend less by making it impossible to go over your budget. Also, shop with a list. This is especially beneficial when grocery shopping. Write a list of the things you are going to the store for and don’t deviate. Making sure you put everything on your list you need the first time is key to making this work. It’s easy to see things in the store you want as you’re shopping but if it isn’t on your list, chances are you didn’t need it in the first place. There are many bad habits that people who are in debt have. Ignoring how much money you’re spending is one of the worst. You need to keep track of your spending so you know exactly where your money is going and where you’re coming up short every month. You can do this by keeping receipts or signing up for budgeting software that links your bank and loan accounts to help you keep track of your spending. Cut the impromptu trips out of town where you’re sure to spend tons of money on transportation and hotels. Limit the amount of weekly bar hopping and dining out. It can even be simple things you do every day that you don’t realize add up to huge amounts per month. This can be as simple as cutting back on your daily trips to your favorite coffee place. To pay off your credit cards faster there are many different methods you can use. One of the simplest methods, for balances that aren’t earth shattering, is to pay more than your minimum amount due every month. This can help you offset interest charges and avoid owing more than you spent on the credit card in the first place. The faster you pay off each of your credit cards each month the more money you’ll have to work into your budget. This can give you more wiggle room when factoring in those trips and dinners. It helps make it okay to get a coffee every now and then, take a trip out of town, or have a nice meal out because your other bills aren’t going unpaid. The key to sticking to your budget is to stay motivated. You can use your spouse for motivation or seek out a friend or loved one who is also trying to stick to a budget. You can use said family member or friend as an accountability partner. This will help you stay on track and keep your budget up which in turn means more money to pay off your bills. You’ll be one step closer to living a debt free life. Sticking to a budget is going to require a change in your mindset. 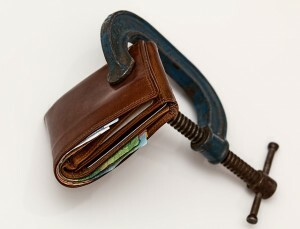 The will to pay off your debt needs to be stronger than the will to spend your money. If you feel the need to buy an item maybe save it until you’ve paid off a bill and then buy it for yourself as a reward. The main point to budgeting is keeping track of what you’re spending before it’s too late. This will help you avoid going negative every month and also keep you on track to get your debt paid off and live a great life.